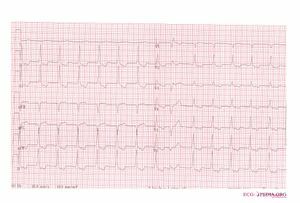 Accelerated idioventricular rhythm (AIVR) is a relatively benign form of ventricular tachycardia. It often occurs during reperfusion after a myocardial infarction. It has a frequency of 60-120 bpm, mostly 80-100. AIVR used to be a good sign, as it made clear that reperfusion was succeeded (especially after thrombolysis, where the success cannot easily be determined without angiography). However, recently debate has started whether among patients with successful coronary intervention, AIVR is a sign of ventricular dysfunction and therefore a slightly worse prognosis. Another example of AIVR, this time with inverted p waves as a sign of retrograde atrial activation. This page was last edited on 14 December 2007, at 15:20.